Marriage must be protected for its own sake, and not just for the sake of preserving religious liberty. Marriage contributes greatly to the common good and is worth protecting, period. Oh, I agree that marriage contributes to the common good. That is why gays should be able to marry and protect their children. ... the child’s birthright of being given the best chance to know and be raised by his own father and mother. What does that have to do with marriage equality? I have said it before; Regardless of whether or not gays can marry, the same heterosexual couples are going to unite in the same marriages, crank out the same kids and sue for the same divorces. Gays adopt children whose birth parents are deceased, unfit or have given up parental rights. So we are forcing heterosexual couples into gay marriages? Oh, I get it. They want to discriminate in public accommodations. That already applies. 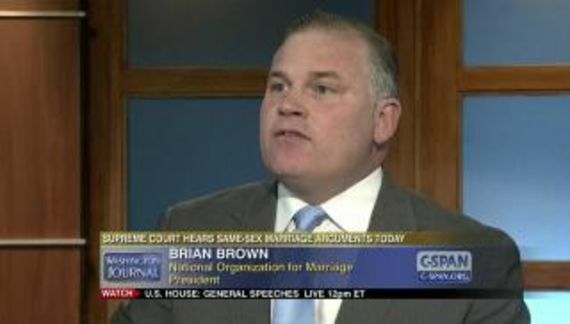 "They" cannot refuse service to a gay couple married or not. What? They want to trot out that photographer in Arizona or that catering hall in New Jersey (states which, oh by the way, don't honor marriage equality)? There was a time when those "Good Christians"TM didn't want to serve mixed race couples. Some still don't. Well, too bad. We're not forcing The Church to marry us, honor our weddings or even recognize our marital status. The "right" to discriminate ends at the church's property line. That's true for the Roman Catholic Church. It's also true for Christian Identity and Scientology.